Oklahoma City, June 30 – Following the second section of the qualifying go-round of the $435,000-added Open Derby, NRHA Five Milllion Dollar Rider Shawn Flarida and NRHA Million Dollar Rider Jason Vanlandingham firmly held on to the 222 top score they both scored in the first section. Flarida rode Shine N Spook (Smart Spook x Ebony Shines) for owner Clark Reining Horses LLC. 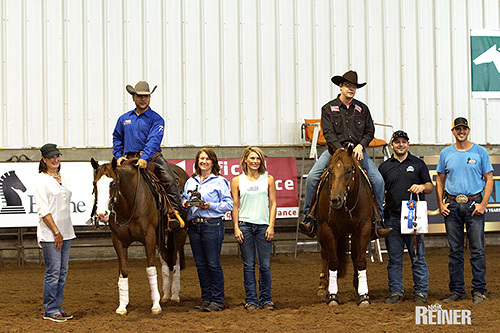 The duo had clinched the 2014 NRHA Futurity L4 Open co-championship. Shine N Spook is a 4-year-old stallion, bred and nominated by Rosanne Sternberg, who has earned $174,921.35 in NRHA competition. Vanlandingham, rode Not Ruf At All (A Sparkling Vintage x All Ruffed Up), owned by Vaughn C. Zimmerman. The talented 6-year-old stallion, also bred and nominated by Rosanne Sternberg, boasts an outstanding $414.916.08 NRHA LTE. With Vanlandingham in the saddle, Not Ruf At All is the 2016 NRBC L4 Open Champion as well as the 2013 NRHA Futurity L4 Open Champion and the 2014 NRHA Derby L4 Open Champion. In the first section, Gabe D. Hutchins riding FM Shine N Tag Chex (Whiz N Tag Chex x Shine With Wanda), owned by Tamarack Ranch LLC, scored a 220 to lead the L3 division. Bred by Ann Ramsay and Carol Rose, the 5-year-old stallion has won $108,174.49 in NRHA competition. In the second section, Fernando Salgado and Electric Cha Ching (Jacs Electric Spark x Kipper Lady Nic) equaled Hutchins’ score tying for the lead in the L3 and earning the top score in the L2. Daniel Schloemer held on to the L1 Open division thanks to the 218.5 that he scored yesterday aboard Electric Grid (Jacs Electric Spark x GVS Cherokee Jac). The 6-year-old gelding owned by Jennifer T. Deweese and nominated by Troy and Andrea Heikes has won $34,125.91. NRHA Three Million Dollar Rider Tim McQuay and Guns R For Shootin (Gunner x Chelsea Lena), a 6-year-old stallion owned by Humphrey Quarter Horses, who was bred and nominated by Eric Storey, are still in the lead in the Prime Time Open division. The duo scored a 219 in the first section. Winning the Level 3 division was Cole Jacobs of Fabius, New York . Although Jacobs wasn’t able to bring a horse to compete at the NRHA Derby, NRHA Professional Josh and Carrie Visser of Whitesboro, Texas, generously let him borrow their 5-year-old stallion, One Big Dream (Magnum With A Dream x Kalico Whiz). “I was a little anxious to try a new horse, but he was great,” said Cole.